This year, Friday Harbor High sent two teams to the annual state marine science competition, better known as the Orca Bowl. The state competition featured 20 teams representing 13 high schools from across the state in a nine hour contest on February 23rd at the Fisheries Sciences Building on the University of Washington campus. The winning team goes on to a National Ocean Sciences Bowl competition which was held in Baltimore last year. About 2,000 students from more than 300 high schools are expected to participate in regional competitions this year. The Wolverines, State champions over the last three years continued their display of prowess in ocean science. The A Team, consisting of Emily Guard, Michael Barsamian, Libby Snow and Gavin Guard came in second in the Washington State competition and were awarded an expedition with Foss Waterway Seaport aboard an educational dive boat. The B Team made up of Ellery Von Dassow, Isabel Gabriel, Max Haenel, and Conrad Bormann came in fourth. Garfield High School claimed the championship this year, but will have to work very hard to retain it in 2014 when the Wolverines again match their knowledge about chemistry, geology, physics, history and economics of the ocean against students across the state. However, Friday Harbor’s A Team's three point loss to Garfield wasn’t the end of the quest. Garfield decided not to compete in the national competition, so Friday Harbor is going to Wisconsin in April, competing in a field of about 24 teams. The coach this year was Derek Smith of UW Friday Harbor Labs and biology teacher Jesse Visciglia stepped into the role of faculty advisor. 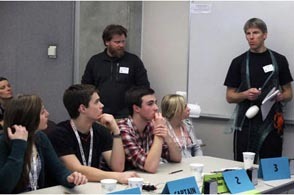 The state Orca Bowl is hosted by Washington Sea Grant and the UW College of the Environment. The Consortium for Ocean Leadership (based in Washington, D.C.) sponsors the National Ocean Sciences Bowl.